The discovery that almost any woman could learn the technique of menstrual extraction was accompanied by the discovery of several obvious and very practical uses for it. Women could free themselves of heavy, crampy periods, or avoid having a period if it would interfere with travel, vacation or perhaps an athletic event, and could extract the contents of the uterus if there was the possibility of unwanted pregnancy. 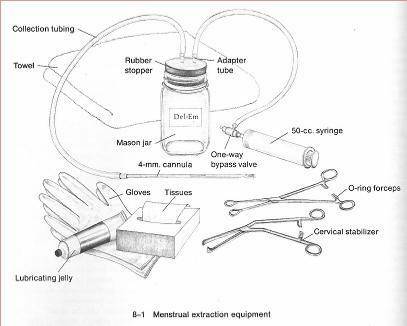 Menstrual Extraction (ME) is a Self Help health care method where a Del Em is used to suction out your menstruation or early pregnancy with the simple syringe and cannula system. Menstrual extraction evolved out of feminist's work to make abortion safe and legal, the 1973 Supreme Court decision changed the group's primary interests to research of the method. They did not expect that all women would use menstrual extraction as a backup when birth control failed. They were aware, however, that one or two menstrual extractions a year carry far less health risks than either an IUD or the Pill. 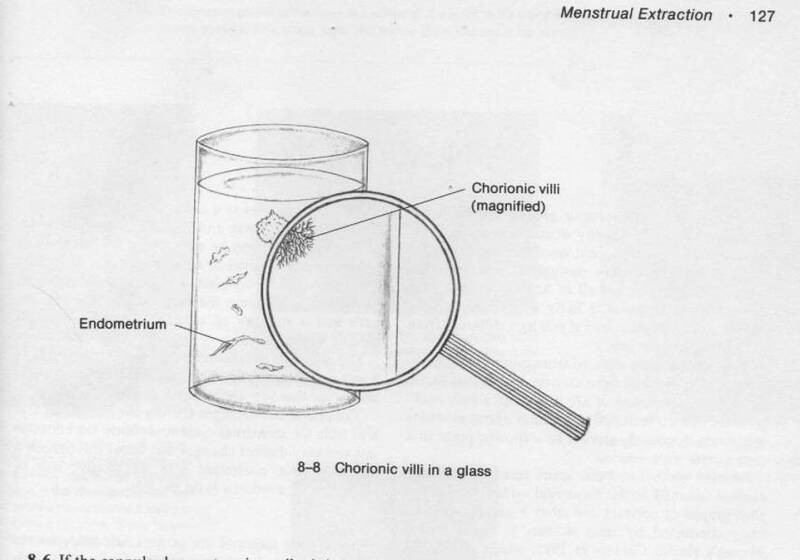 Menstrual extraction and early termination abortion are similar technically, but menstrual extraction is not performed in a medical setting. When done by an experienced group, it can be used simply as a home-care procedure by women wishing to gain knowledge about their bodies and menstrual cycles and to exert more direct control over their reproductive lives. Although prior discussion with your doctor as to your intention in using menstrual extraction is not necessary, having a physician available to you, should any medical questions come up, would further increase the safety of the procedure. Menstrual extraction can be done in a woman's home or a self-help group's meeting place and the woman having her flow extracted controls all aspects of the procedure. Women generally learn the technique by participating in Self Help groups with more experienced women, first observing and then having their own menstrual extractions. Although the rudimentary aspects of the procedure can be learned in a few weeks, the knowledge and skill necessary to the reasonable safety of the procedure usually develop over a period of several months or even a year. Without this body of knowledge, the isolated woman, who generally has little or no familiarity with her own body, is risking the dangers commonly associated with self-abortion. An objection to menstrual extraction is fear that the introduction of a cannula into the uterus will cause infections or other complications. Over the past decade, hundreds of women doing menstrual extraction in the United States and in other countries have reported that they do not have more or fewer infections than other women and have noted that the passage of a very small cannula into the uterus does not appear to have any effect on a woman's ability to carry a future pregnancy. It would seem, however, that the primary reason for this excellent safety record is the rigorous selection process any group doing menstrual extraction follows and the care with which the procedure is carried out. Women who have a tendency toward infection probably should not elect to have menstrual extraction. If they do, they take extra precautions. Sometimes a woman who is highly motivated but has a very sensitive cervix chooses to tolerate the additional discomfort in order to have an extraction. Menstrual extraction should not be viewed as an attempt to avoid menstruation or short-circuit natural functions. It is a means for a woman to exert influence over changers in her body which she could not control before, in order to eliminate occasional discomfort or inconvenience or an unwanted pregnancy. Through working for abortion reform in the early 1970s, the early self-help clinic in Los Angeles became acquainted with the new, gentler suction method of removing the uterine contents - a method which was to revolutionize abortion technique. Out of this work they evolved the technology for removing a woman's flow, on a monthly basis or less often, and called it menstrual extraction. They unearthed articles in Russian and Chinese medical journals showing hand-operated vacuum equipment and recommending the procedure for contraceptive purposes. They were aware of research in the United States on early-termination aspiration abortion without cervical dilation and with the use of a large syringe attached to a flexible plastic cannula (similar to a soda straw) or a portable foot pump. The group found that menstrual extraction was not difficult to learn and that the introduction of a sterile four-millimeter cannula into the uterus was not traumatic because it did not require that the cervix be dilated. There was no cutting or scraping, so simple sterile procedures were sufficient; anesthetics were not necessary; and the suction was sufficient to extract all or most of a woman's flow in around 20 to 30 minutes. When done by an experienced group, Menstrual Extraction can be used simply as a home-care procedure by women wishing to gain knowledge about their bodies and menstrual cycles and to exert more direct control over their reproductive lives.